Camping is a great vacation option for families with young children, it’s an economical choice, eco-conscious and develops a love of nature in young people. In an age where children spend more time on their devices than ever before, a camping trip allows some rare screen free time and a chance to connect as a family. When we took our toddler on his first camping trip we chose the middle ground, selecting a site that offered some covered accommodation with real beds and a few electronic appliances, plus a private outhouse, this made our first camping trip as parents a little more comfortable, we also chose a spot close enough to town that if we had any real problems, civilization was close at hand, it also meant we could go grab a pizza for supper one night to make the experience even easier. Now that we have done it a few times we have realized that camping with small children isn’t actually that difficult and we don’t even need some of those luxuries at all. The sheer pleasure our little one gets from being wild and free for a whole weekend or longer is worth a little pre-planning and preparation. However, many people worry that camping with small children is difficult, they have safety concerns, worry about their child’s comfort and presume you would have to bring a huge amount of resources and special gear. The truth is children are actually far more adaptable than most adults and thrive on adventure, as long as you remember a few essentials and a few home comforts you can ensure your child’s first camping trip is the first of many. Read on for my top ten list of things you should take with you on your trip to ensure you have happy kiddy campers. don’t forget garbage bags, small plastic baggies, scented diaper bags, wipes, antibacterial hand sanitizer and kitchen paper, to make any kid size mess disappear. If children are having fun, they’re getting dirty, so make sure you have a good selection of spare clothes for a variety of weather conditions. Take more clothes than you think you’ll need and pick cozy soft fabrics, it can get chilly at the campsite in the evenings. Give your child their own child size versions of your equipment, such as a flashlight to light their way, camp chairs to enjoy the campfire, and any age specific items that can make you trip more comfortable and safety conscious, like a portable highchair, and playpen. Be sure to pack extra batteries to prevent disappointment. Glow sticks are cheap and keep children entertained for hours-a must have! They can also be joined together to mark obstacles in the campsite, highlight zippers in tents, or guide the way to the washroom. Children enjoy having responsibility for their own belongings, plus this keeps all their toys and materials separate from the rest of the camping supplies. Having one small backpack forces children to streamline their packing, if it doesn’t fit inside, it can’t come on the trip. The idea of spending the day inside a soggy tent with stir crazy kids, keeps many parents from ever trying camping with their children, but as long as you pack a few rainy-day activities you can pass the time until the rainclouds move on, in relative harmony. Board and card games, craft resources, coloring, stickers and a selection of stories can help to pass the time. A well-stocked first aid kit is essential for all trips but inevitably children are going to get scrapes and cuts when playing outdoors, some antiseptic lotion and a few bandaids are the bare minimum. Sunscreen and bug spray suitable for children are also required products. A plastic bin is a versatile item to pack, kids can tote their toys around the campsite, use it to help carry food and drinks to mom or dad, it can keep items off the floor and organised, can be used to collect items during a scavenger hunt and can be filled with soapy water for washing toys when mom or dad are doing the dishes. These spongy tiles from your playroom back home pack up flat and can make the inside of your tent cozy and soft for little feet. As there are more hazards at your campsite than back home, you do need to take some basic safety measures to keep your little ones safe from campfires, animals, water dangers, and nearby roads. The safety precautions you put in place will differ based on the age of your child, but it’s a good idea to always assign at least one adult to supervise the children. A basic safety kit should also accompany you on all trips, a map, whistle, water and snack are essential. Last but not the least, if you would like to relax and take a nap under a tree, take a hammock with you to enjoy. 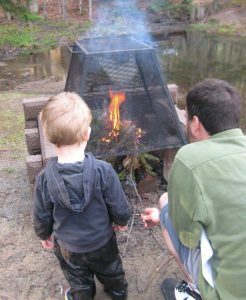 Children love to be outdoors, a day spent exploring nature, getting mucky and being active really tires them out, and as they cuddle up in their tent and fall asleep, mom and dad get some rare grown up time around the campfire. 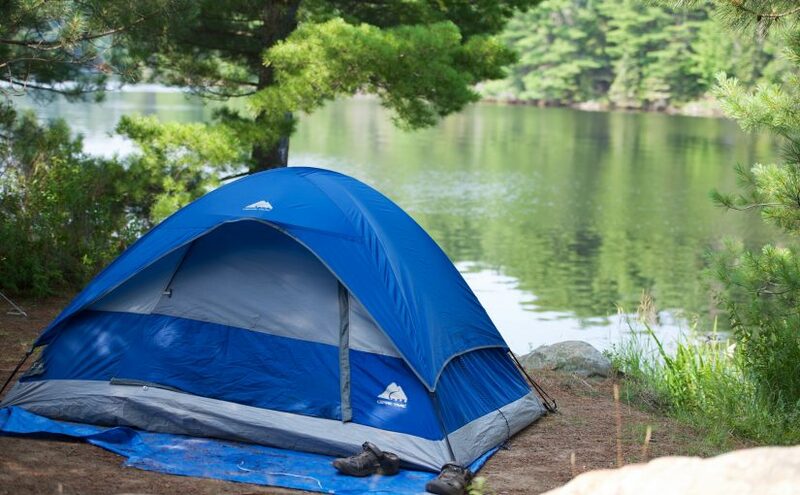 Camping with children is cheap, fun and creates lasting memories, so what are you waiting for? By Fiona Tapp – Freelance Writer and Educator, www.fionatapp.com.